Fortuna Community Garden, located behind Christ Lutheran Church on Smith Lane, is getting revitalized! The garden has been in existence for over 15 years. A new picnic table was recently given to the garden by an anonymous donor. Support from North Coast Community Garden Collaborative enabled the garden to get enough lumber to repair four garden beds that are badly deteriorated. Several new gardeners this season have brought new energy to the garden. The garden has 32 raised beds that are 4 ft x 12 ft. The beds are rented for $5 per season ($20 per year). There is still room for more gardeners. If you are interested in gardening in the Fortuna Community Garden, would like to support the garden, or want to learn more about the garden, please call us at (707) 725-2995 on Thursdays and Fridays from 8am to 2pm. The Table Bluff Community Garden is hosting the October Gardener Meet-&-Greet on Tuesday October 14 from 4:30 - 6:30 p.m., 1000 Wiyot Drive, in Loleta. We hope you can join us for garden tours, snacks, and networking with other members of North Coast Community Garden Collaborative. The garden was featured at Wiyot Day on September 6, a day celebrating Wiyot Tribal culture and traditions. The garden had a display featuring a newsletter, poster featuring photos of the garden, and a sign-up sheet for new members. They day included ceremonies and dances throughout the day, a delicious meal with fresh salmon, and vendors selling handmade jewelry and crafts. The garden is coordinated by the Wiyot Tribe and is welcoming new members. For more information about the garden please contact the Tribal office at (707) 733-5055. Redwood Community Action Agency coordinates a Demonstration Garden, which is located in the backyard of its Energy Demonstration Center on the corner of 6th and T Streets in Eureka. The garden provides fresh organic produce year-round to clients of several Redwood Community Action Agency (RCAA) homeless shelters, as well as opportunities for community members to learn ecologically-sound methods of growing food. The garden is welcoming volunteers to help in the garden, which is currently growing broccoli, lettuce, kale, chard, peas, cabbage, cauliflower, beets, radishes, spinach, zucchini, lemon cucumber, and strawberries. There are also herbs like parsley, rosemary, thyme, lavender, and oregano; blueberry bushes; apple trees (some of which are espaliered); and several artichoke plants. If you are interested in gardening at or supporting RCAA's Demonstration Garden or would like to learn more, please contact debbiep@nrsrcaa.org or (707) 269-2071. The University of California Cooperative Extension in Humboldt is hiring a 4-H Community Educator. The 4 - H program is a 100 year old program offering leadership opportunities for local youth. The deadline for applications is Monday October 13. More information is available at cehumboldt.ucanr.edu/jobs/. There is much to be done in the garden still as we move into Fall. On the coast fast growing crops can be planted from starts, such as lettuce, spinach, cilantro. Hearty greens like kale and chard, which overwinter well, can also be planted from starts. Radishes and garlic can be planted now as well as strawberries. Using floating row cover or building mini 'greenhouses' with plastic and PVC pipe can help extend the growing season and protect young plants on cool nights. Mulching root crops with rice straw will help protect them, but leave any new seedlings unmulched to maximize daytime soil temperature and minimize damage from pests. If you're not growing food this fall and winter, consider planting a cover crop to grow throughout winter and be tilled in during spring to add nutrients and organic matter to the soil. Fava beans, bell beans, vetch, and rye are good options. Fall is also a good time to clean up the garden - remove any old plants and weeds. Give the ol' compost pile some TLC and maybe a nice treat of some manure to chew on over winter. Cover unused beds - a layer of cardboard and mulch can suppress winter weed growth, making it easier to get into the garden come Spring. For more gardening tips check out local farmer Eddie Tanner's The Humboldt Kitchen Gardener, available at local book and garden stores, and visit www.northcoastgardens.org for links to free gardening resources. Redwood Community Action Agency's Demonstration Garden on 6th and T Streets in Eureka provides fresh organic produce year-round for clients of its shelters and programs for houseless youth and families. - Native Plant Sale: Saturday October 4 from 10 a.m. to 3 p.m. at Bayside Grange, 2297 Jacoby Creek Road, Bayside. Lost Coast Native Plant Nursery and Samara Restoration Nursery and more. Proceeds benefit the North Coast chapter of California Native Plant Society. More information is available at www.northcoastcnps.org. - DIY Drought Solutions: Saturday October 4 from 11 a.m. to 4 p.m. at Arcata Community Center (321 Community Park Way). Free event with resources and workshops. See article in opposite column. - Fortuna Apple Festival: Saturday October 4 from 10 a.m. to 4 p.m. in downtown Fortuna. Join us for an old-fashion street fair with plenty of apples, cider, food vendors, tours of Clendenons, Fire Truck open house, and live music at Rohner Park. For more information please call (707) 496-4495. - Petrolia Apple Festival: Sunday October 5 at the Mattole Grange. Contact the Grange for more details at (707) 629-3431. - Humboldt Regeneration Brewery and Farm Openhouse: Sunday October 5 from 12 - 8 p.m. at 2320 Central Ave Unit F in McKinleyville. Visit the farm and learn about sustainable grain production and processing. After a few samples you may want to join the CSB (community supported beer) program. Call (707) 738-8225 for more information. - Humboldt Permaculture Guild Meeting: Tuesday October 7 from 5:30 - 7pm at location CCAT on HSU Campus (walk up hill from 14th and A Streets). Contact (707) 502-4309 for more details. - Demo by UC Master Food Preservers - Edible Gifts: Wednesday October 8 from 6 - 7 p.m. at Arcata Co-op Kitchen. Free class but registration is required in advance at www.northcoastco-op.com. - Free Health Fair: Thursday October 9 from 11 a.m. - 4 p.m.. at Cher-Ae Heights Casino. - Humboldt Food Policy Council Meeting: Thursday October 9 from 5:30 - 8 p.m. at the Link (1385 8th Street in Arcata). Anyone is welcome to provide input to this group working toward an accessible sustainable local food system. Please RSVP to Laura.McEwen@humboldt.edu and questions to (707) 269-2071. - 5th Annual Salsa Competition: October 11 from 12 - 1:30 p.m. on the Arcata Plaza. Sample salsas created by local youth and chefs. 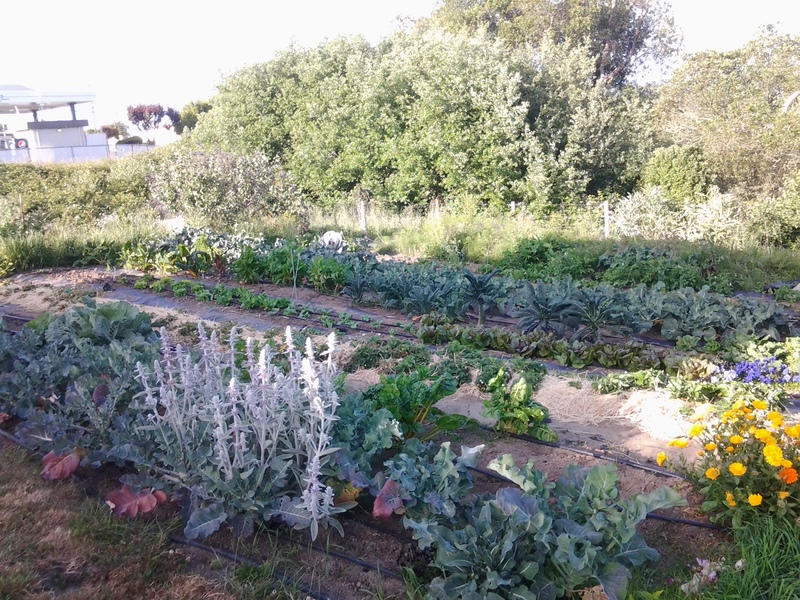 - On the Plate Community Garden Event: October 12, time TBA at Redwood Acres Fairgrounds Garden, 3750 Harris St, Eureka. More information is available at www.redwoodacres.com/events. - Deadline for UC 4-H Community Educator Applications: Monday October 13. More information is available at http://cehumboldt.ucanr.edu/jobs. - Free Farmers Market, Southern Humboldt: Tuesday October 14 from 10:30 a.m. - 12 p.m. in Garberville at the Presbtyrian Church (437 Maple Lane) and 12:30 - 1:30 p.m. in Redway at the Baptist Church (553 Redway Drive). Bring your own bag. - Gardener Meet-and-Greet and Monthly Meeting: Tuesday October 14 from 4:30 - 6:30 p.m. at Table Bluff Community Garden, 1000 Wiyot Drive, Loleta. Monthly meeting from 4:30 - 5:30 and from 5:30 to 6:30 p.m. visit the garden, get free resources, enjoy snacks, apply for CalFresh, and discuss garden questions. Please call (707) 269-2071 for more information. - Free Farmers Market, Fortuna: Wednesday October 15 from 11:30 a.m. - 12:30 p.m. at 2331 Rohnerville Road. Bring your own bag. - Free Farmers Market, Eureka: Thursday October 16 from 12 - 2 p.m. at Food for People, 307 W. 14th Street in Eureka. Bring your own bag. - Grilling at the Garden: Thursday October 16 at 3 p.m. at Kin Tah Teh Botanical and Community Demonstration Garden, Hwy 96 next to Rivers Edge Day School. Grilled veggies, potluck, and fun. Contact (530) 515-1106 for more information. - Festejando Nuestra Salud - (Health Fair for Spanish Speakers): Sunday October 19 from 12 - 4 p.m. at Redwood Acres Fairgrounds. More information is at www.redwoodacres.com/events/. Gardening Gazette is a free publication of North Coast Community Garden Collaborative, a support network of and for community gardeners. Learn more at www.northcoastgardens.org.